Heat grill for indirect grilling: Light one side of grill, leaving other side unlit. Close lid; heat grill to 400ºF. 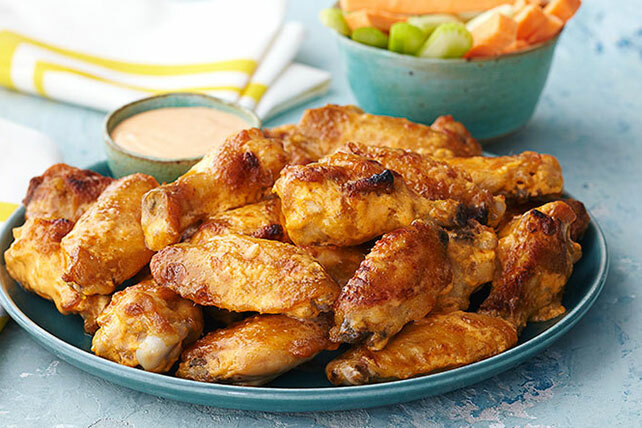 Place wings in single layer in shallow foil pan. Place pan on grate over unlit area; close lid. Grill 20 min. or until wings are lightly browned, monitoring for consistent temperature. Meanwhile, mix mayo, hot pepper sauce and garlic powder until blended. Reserve 1/2 cup mayo mixture; mix remaining mayo mixture with ranch dressing. Brush both sides of wings generously with reserved mayo mixture. Grill 15 min. or until wings are done. Serve with dressing mixture. Serve at your next party along with some cut-up fresh vegetables, such as celery and carrot sticks. When grilling over indirect heat, the food is not cooked directly over the heat source. The covered grill then acts like an oven, so there is no need to turn the food. The indirect grilling method is used for foods that require at least 25 min. of grilling time or foods that are so delicate that direct exposure to the heat source would dry them out, such as roasts, whole chickens, thick steaks, ribs or delicate fish fillets. To set up a gas grill for indirect grilling, light one side of grill leaving other side unlit. Close lid; heat grill to desired temperature. When ready to grill, place food on unlit side to cook as directed. If using a charcoal grill, preheat the grill by lighting the coals and heating them to desired temperature. Then, move the coals to outside edge of charcoal grate. Place the food in the center of the grill grate and grill as directed. Prepare using KRAFT Light Mayo Reduced Fat Mayonnaise and KRAFT Lite Ranch Dressing.